Galvanized black steel mailbox is 21-1/2″ long by 10″ tall and 8-1/4″ wide. This mailbox is US Postmaster approved. 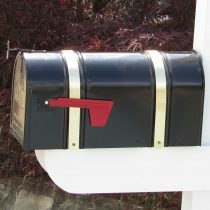 Mailbox has a black rust resistant smooth finish. 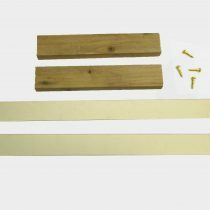 The brass straps include mounting blocks, brass screws and a protective wrap that can be removed at the time of installation. Replacement brass straps for #1-1/2 Rural Mailbox. Straps include hardware and mounting blocks.